First off, don’t forget that the amazing Lunch with me and Jen Lancaster contest is still going on through September 6, so click here for all the details! 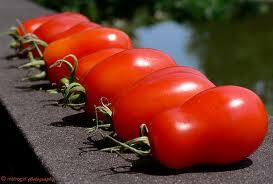 It is neighbor’s garden and Farmers Market time, and one of the things that everyone has in abundance is tomatoes. Were I not completely incapable of growing anything, and had a garden, I would grow tomatoes. And yes, I can hear many of you saying there is no such thing as a black thumb, and of course I could grow things if I wanted. Fake tree. Dead. All the fake leaves fell off of the fake branches like a weird little autumnal scene in my living room, except they didn’t turn colors first. I was left with an odd fake twiggy thing with a few leaves holding on for dear life. I am not exactly sure what happened, but once it gave up the ghost, I knew my plant growing days were over. People who know me well call me The Cooler , and ask me to come over and just touch their more insidious weeds. I buy fresh herbs, and I shamelessly accept piles of garden goodness from my green thumb friends, and I go to the farmstands in the country and farmer’s markets in the city. But cooked, in pretty much every fashion, LOVE! You will surely find me picking slices off sandwiches, pushing chunks off of salads, and declining Bloody Mary’s. And in the summer I am likely to make Caprese Salad with watermelon subbing in for tomato. I like my bruschetta topping cooked and served warm or at room temp. All of my gazpachos are white. However, bring some heat to the party and the tomato is my bestest friend. 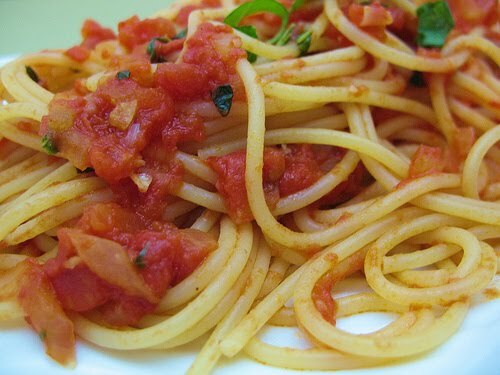 I love a good red sauce on my pasta. I think of ketchup as a major food group. I adore tomato soups of all warm varieties. I like them confit in olive oil, and even like tomato pudding, a really old school side dish that could easily be a dessert with just a scoop of vanilla ice cream on top. For a hilarious read about Jen Lancaster making this soup, click here. Add alphabet noodles , mini meatballs, or cooked rice for kids. Stir in toasted croutons and drizzle with olive oil and shredded Parmesan for a classic Pappa al Pomodoro. Add fresh basil and garlic and you have a chunky pasta sauce. Add fresh oregano and it becomes pizza sauce. Freezes beautifully, can be canned if you are ambitious, and lasts up to two weeks in fridge. Scatter the bread cubes evenly over the bottom of a 1 ½ qt buttered casserole dish , and pour the butter over the cubes. Let absorb completely, about 10-15 minutes. 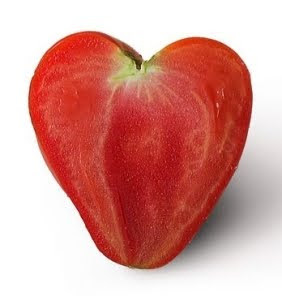 Mix tomato puree with water, salt, and sugar and bring to a boil in a small saucepan. Let boil for 5 minutes, then pour over bread. Cover and bake at 325 degrees for 30-35 minutes. Serve hot. Nice to meet another "black thumb"!!! I am definitely going to have to try that tomato pudding - it looks and sounds wonderful and just a little different!!! This event has been so much fun!! My contribution is a Tomatoes with Feta Mousse May not be up your alley since the tomatoes aren't cooked - LOL!! 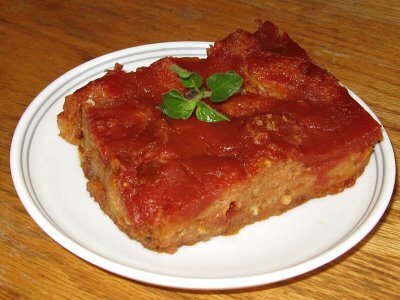 love the tomato pudding - we make a tomato and bread soup! how could you blaspheme the tomato by casting it off salads and sandwiches?!? the tomato is a thing of beauty and wonder, and the jersey tomato is in a class all its own--entire festivals are devoted to honoring it. i suppose that you redeem yourself--marginally--by liking cooked tomatoes. :) have you tried the easy tomato sauce recipe over on smitten kitchen's website? i made (and blogged) it back in february. 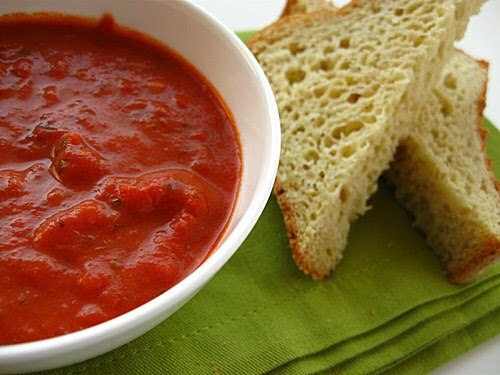 the sauce is quick and delicious--a paradox according to the superstitious sicilian women in my family who innately distrust any recipe that doesn't involve giant stock pots and days spent cooking in a sweltering kitchen. Spent three years in NJ, never had better tomatoes before or since. And this summer in DE, the heat made for very tough skins. Made the Toasty Soup - perfect cold, using it for lunch until it runs out. thanks!